Nearly any discussion on holistic ministry, or the balance between proclamation and social action, induces strong emotions. Most of us feel strongly about one or the other, and we usually struggle to integrate proclamation of the gospel with demonstration of gospel love. Those who focus on demonstrating God’s love by meeting the physical needs of suffering humanity are frequently accused of watering down the gospel, or even ignoring man’s greatest need – that of reconciliation with his Creator. Those who focus primarily on proclamation of the truth of Jesus as the only way are seen as lacking compassion, and even ignoring man’s pressing needs that keep him from understanding the love of God. But the Bible clearly tells us we need to do both – or rather, do it all. Proclaim God’s love and truth, do all we can for people to have access to what God says about himself and them, be incarnational representatives of the Kingdom of God anywhere and everywhere, and continually assist with the unbelievably overwhelming needs of a world that groans for its Creator, Savior and Lord. We do the gospel, the love of God toward us, and His love through us a disservice when we ignore any part of our mission. I see numbers 1-7, in the main body of the graphic, as being of equal priority. 8-10 are necessary as well, because they enable us to do tasks 1-7. The Lausanne Covenant summarized our task as “The whole church taking the whole gospel to the whole world,” and the 2010 Cape Town Commitment, in the Call to Action, listed a number of priorities for the church in working out that covenant. Every aspect of our task is dealt with, and both proclamation – especially of truth – and social action are strongly encouraged. And I would wholeheartedly sign my name to the Commitment. 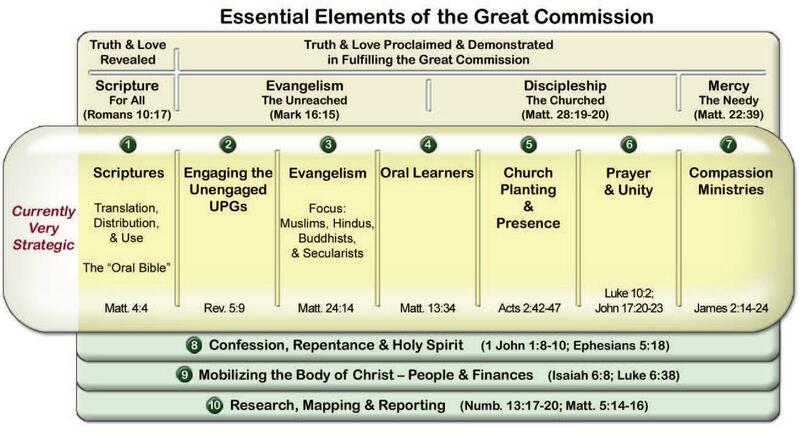 The following elements are listed: proclaiming the truth of Christ; building the peace of Christ; living the love of Christ; discerning the will of Christ; calling the church of Christ back to humility, simplicity and integrity; and partnering in the body of Christ for unity in mission. Every one of these is a necessary element of our mission. No part should be ignored. So, there is a necessity for deed, for social action, for living the love of Christ and building the peace of Christ. Helping the helpless is a noble call, a necessary duty, and a winsome demonstration of God’s love toward His Creation. And, when we help, we don’t help just to “share the gospel.” We don’t build wells only for those who are “open to the gospel.” We help to meet the physical needs of Hindus, Christians, Muslims and atheists alike – because God loves them. No one has to “accept Christ” in order to receive our help. I say this strongly to myself, because I still believe in the priority of proclamation. I still believe that the greatest need of mankind is the need of reconciliation with his God. But, in my own heart and ministry, there will always be a tendency to focus on proclamation and forget compassion – it’s just how I’m wired. All the more, I have to continually preach to myself – help others!! And don’t expect anything from it. Having said that – funny things happen when you help people. First of all, their life begins to get easier – if for no other reason than that they see there is someone who cares about them. Second – your life is touched and changed. God’s love grows in you as you exercise it. Third, a trust relationship begins that does usually lead to opportunities to talk about other, significant needs – like reconciliation with God. And reconciliation with God leads to reconciliation with others, and what was probably a downward spiral in the life of the person helped begins to spiral upward instead. And that is so much fun to be a part of!